Dwun lives in the biggest castle in Greed Island. It's his responsibility to give out the prize for the quiz and the prize for the eventual winner. 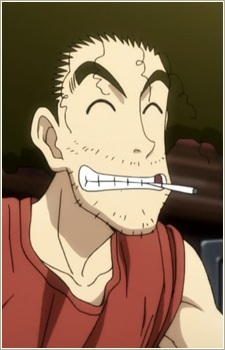 He's extremely messy and childish, making fun of Gon for expecting leads to find Ging. The "D" in "Greed" (Island) is because it's his first letter. He also asks Gon if he would prefer a regular or tailored ending, even though no custom made ending exists. He tells Gon that Ging is an awful guy. Dwun's real name is Wdwun. When Ging found out he said "I see. Then take out the W. From now on, you're D-w-u-n, Dwun." In his room it appears he does nothing but chain smoke and play games. He can even use his feet to smoke.